Fifty years after the trial of architect of the Holocaust Adolf Eichmann, Gavin Esler explores how it shaped modern Israel. Adolf Eichmann was responsible for sending millions of people to the Nazi death camps during World War Two. After the end of the war he escaped to Argentina, but in 1960 he was snatched by the Mossad, Israel's intelligence service and brought to Jerusalem to stand trial. In this programme the award-winning journalist Gavin Esler travels to Israel to meet those involved in Eichmann's dramatic and controversial capture and trial. The kidnapping violated Argentina's sovereignty and was condemned by the UN. 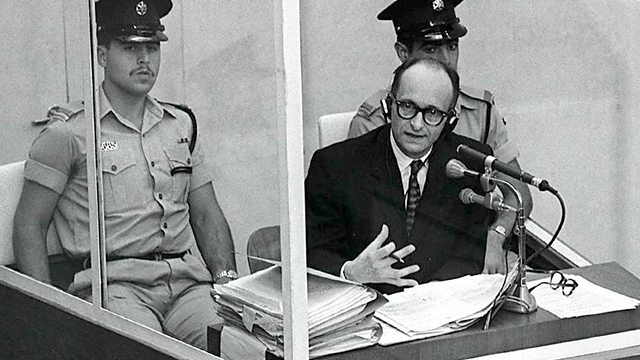 Questions were raised about whether it was appropriate to try Eichmann in Israel, and international Jewish leaders feared an anti-Semitic backlash. David Ben-Gurion, Israel's Prime Minister, insisted that the Jewish state was the only heir of the six million murdered and that the trial would fulfil a historic duty. In the event it forced the young country to confront its history in a way that had profound consequences. Gavin meets Rafi Eitan, who lead the Mossad team and who recalls his acute sense of being involved in something momentous. Gabriel Bach, the deputy prosecutor, explains that Eichmann's defence 'he was only following orders' was laughable. In fact he disobeyed orders to carry out his extermination ambitions. Michael Goldman Gilad, who survived Auschwitz, became a policeman and witnessed Eichmann's execution. He remembers being forced to spread ash from the Birkenau crematorium onto the icy ground so SS officers wouldn't slip. Only when he saw the tiny pile of ash after Eichmann's cremation did he realise how many bodies must have made up the ash mound in the camp.